Australian Native Birds - Australian Magpie Facts and Myths! Do Magpies Mate for Life ? Peter has been a birdwatcher since he was a young lad. He would love to share with you images and stories about Australian birds ! The Australian Magpie (Cracticus tibicen) is a medium-sized black and white bird native to Australia. Although slightly larger The Australian Magpie is more closely related to the Butcherbird. Australian Magpies would be regarded as a medium size bird measuring from 37 - 45 cm in length and when in a song have the most beautiful of 'warbles' of any bird I have heard. Magpies being omnivores are never short of food and we often see them fossicking through the cut grass for fresh food. Magpies spend a lot of daylight hours on the ground and they are also unusual in the fact that they walk and run, one foot after the other, not hopping or waddling like a lot of other birds. 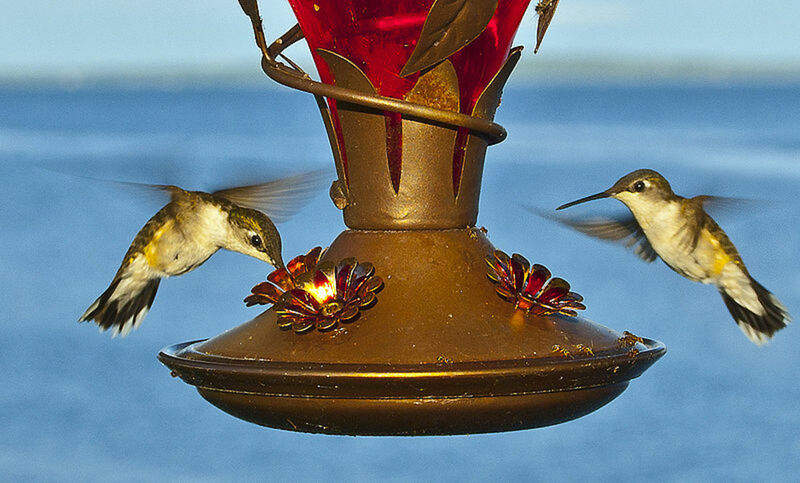 These birds are quite territorial and usually stay in a family group. Do Magpies Mate for Life ? Magpies generally mate for life, although the alpha male generally has more than one female with which to mate and they live as a type of family commune. Magpies are actually from the same family as the Butcher bird (Cracticus torquatus) and not related to the Pied crows from which they got their name. Magpies generally mate for life , although the alpha male generally has more than one female with which to mate and they live as a type of family commune. They are very territorial and will fight with other Magpies to keep there neck of the woods. However they will share their space with other species without a problem. Unlike other birds they walk fairly upright and do not hop or waddle like most other birds. In a sporting sense the most famous (arguably) and hated (without question lol ) football team in Australia is Collingwood and they are called the Magpies due to their black and white colored jumpers. Over the years I have developed an affinity with Magpies and have a certain love of the way they live their lives. Some years ago now a family of Magpie adopted our back garden as their home and over a period of time they learned to trust Oliversmum and me. We started out earning their trust by putting out small tidbits of minced meat for them to eat. To digress just a bit. If you do decide to feed birds never put out so much that they become dependent upon you and lose their natural ability to gather their own food. This family of Magpies, there was only Mum and Dad at the time, would come down every day and take the food; becoming so tame that they would eat out of our hands and trusted us so much they would even come into our enclosed back porch. We could see their nest high in a Cyprus Pine tree and as soon as we opened our door the Magpies would glide down and land gracefully on our lawn. 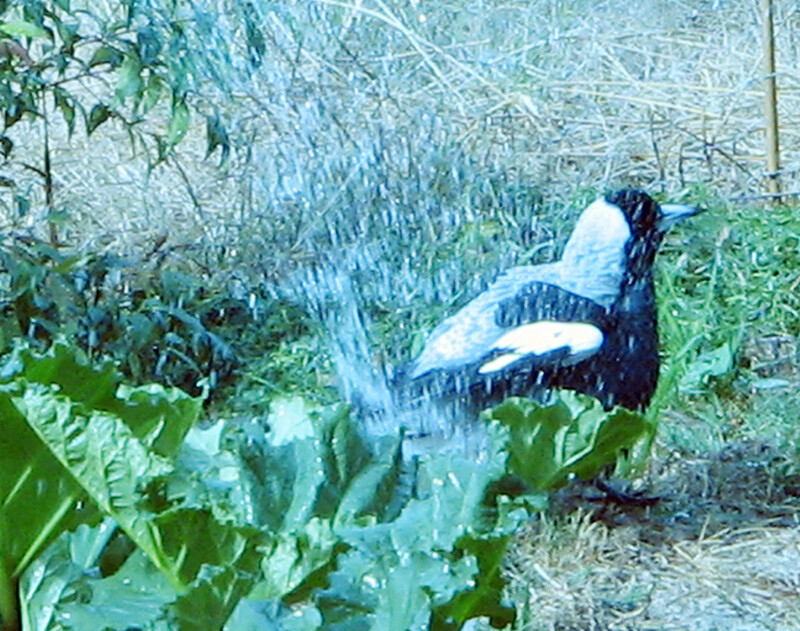 The first Spring came and we realized that the Mum Magpie had laid eggs and was involved in the incubation process. After the hatching, we could see that there were two hungry mouths to feed and both Mum and Dad Magpie were busy gathering food for the two nestlings. The baby magpie that you see in the nest high in the tree is at our estimate only 1 week old, if you look closely it's eyes are not yet fully open. However, it is already strong enough to be demanding food from Mum and Dad Magpie and they are being run ragged keeping up supply. Although we can't make it out as yet we have an idea that there may be another magpie hatchling in the nest. BTW the nest is about 40 feet up from the ground! After a few weeks the task of getting the nestling to fly was at hand for the parent Magpies! The first Fledgling to leave the nest was no problem it came down and landed very clumsily and got up and looked for cover and over the next week or two became quite proficient at flying. The second Nestling however was not so fortunate. It did not leave the nest for quite some time and we did not realize until later that it was carrying an injury. When it did come out of hiding we could see that it was limping and one of it's wings was hanging down lower than normal. We were hoping that with the help of Mum and Dad Magpie it would soon come good. It did not take us long to come to the conclusion that things were not improving and that sooner rather than later something would have to be done for this poor Fledgling. So we mapped out a plan to try to rescue this poor little bird and take it to the Veterinary Clinic (In our state Veterinary Clinics will treat wild animals free of charge). We prepared a cardboard carton big enough to accomadate the bird and packed it like a nest. Next we had to wait until Mum and Dad were distracted and then just pick up the bird and put it in the carton. Sounds easy... Right? Wrong, we were not counting on the maternal instincts of the Mum Magpie! Picking up the baby Magpie was not the problem, it did not struggle at all and fortunately for me, knowing how hard Magpies can attack, I had put on a thick jacket and a reasonable hat. In the 20 metres or so that I had to walk from picking up the baby the Mum Magpie attacked me all of the way. Grabbing at my head and arms and pecking at my face. Fortunately for me no damage was done. We then took the baby to the Vets for a complete inspection. The prognosis was not good. The bird had a severely damaged wing and leg (probably caused by falling from the nest ) and the Vet told us that it would never fly or be able to perch on a branch and was surprised that it had survived for so long. Oliversmum and I were both terribly upset for the Mum and Dad Magpie and they seemed to be fretting themselves. It took about a week before things got back onto an even keel and they resumed taking feed from us. By this time the surviving baby Magpie was also queuing up for its food. 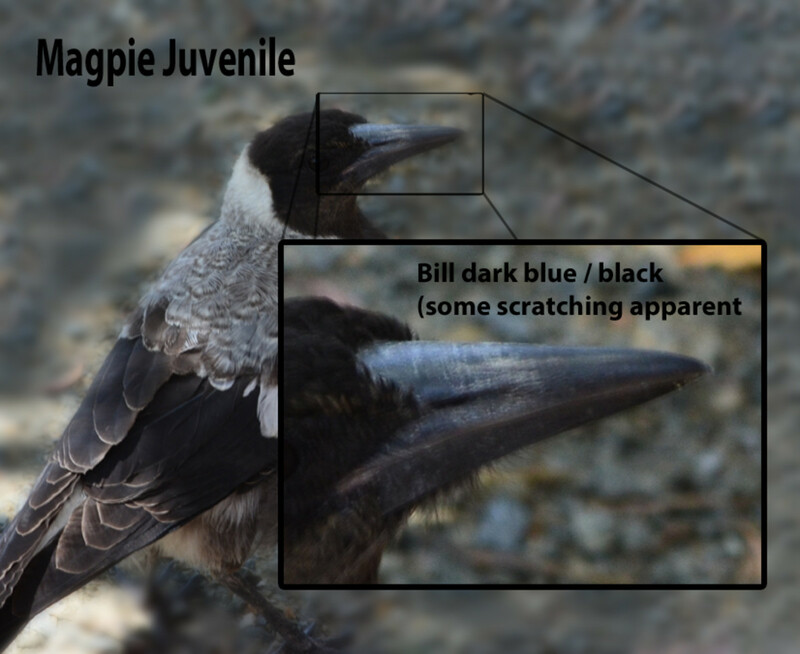 Magpie - Baby, Juvenile, Male, Female ? Telling the difference between baby Magpies and their Mums and Dads can sometimes be a bit difficult? 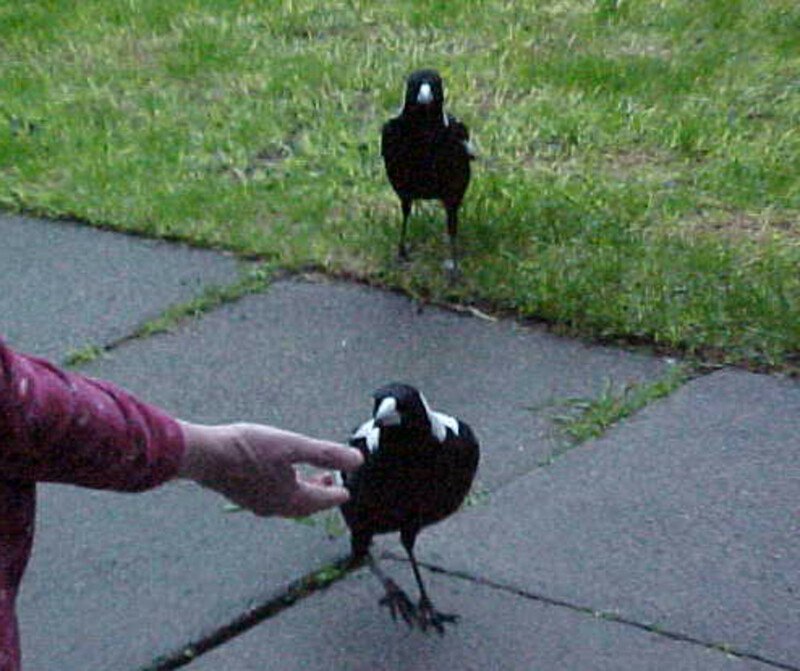 Baby and juvenile magpies have a darker bill than the adult magpie. It has been reported that Magpies can live up to 30 years and as the magpie ages it's bill starts to whiten leaving a dark blueish section at the point. Picking the gender of a Magpie is not as easy? In our neck of the wood, the Magpie male is a larger bird and usually more dominant and aggressive. 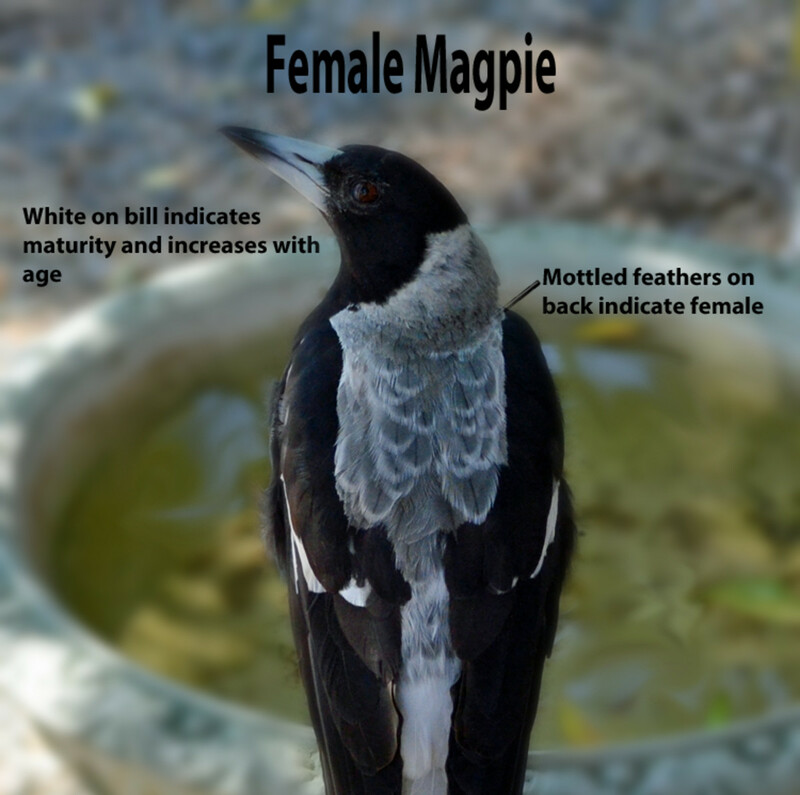 If you look at the back of a male Magpie the 'white' part of his back is almost pure white whereas the female Magpie has a more mottled 'white' section. Magpies Love them or Hate them? Do you regard yourself as a Magpie Nutter? It has absolutely amazed me just how many people have enjoyed an experience with a family of Magpies. I, and I'm sure, our other 'Magpie Nut' club members, would love to hear any anecdotes you would care to share. 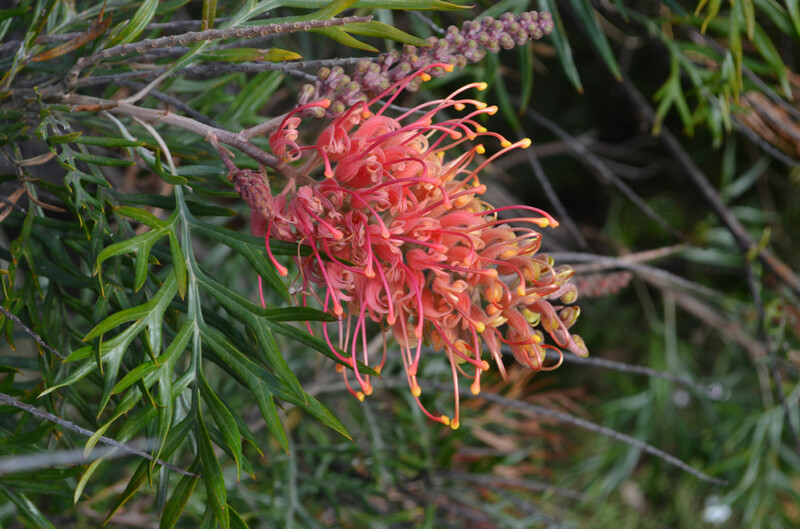 Her name is Robbie Anne and she hails from a beautiful part of Australia just outside of the Ku-Ring-Gai Chase National Park. "He was originally just André, however he took on the names of my other cats after they passed away." For now, we will call her cat "Taeko". Taeko on a regular basis shares space with her Magpie friends! 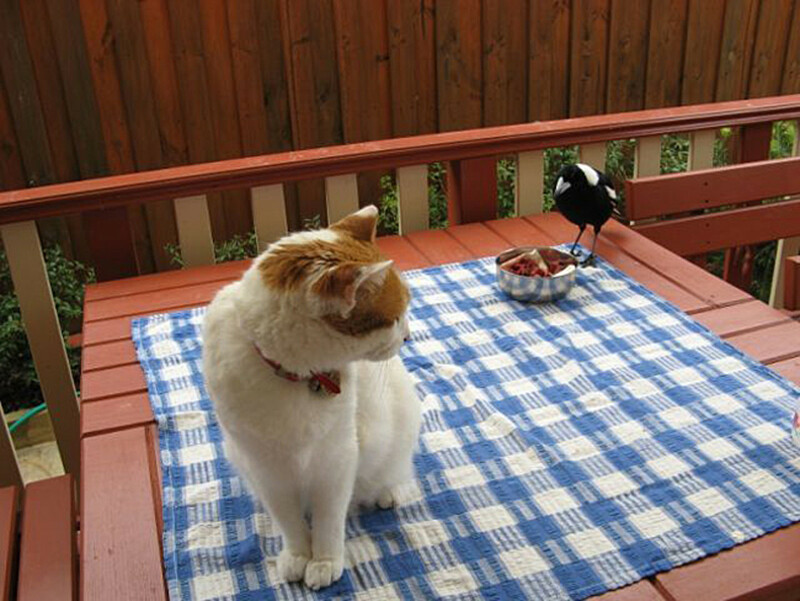 Robbie Anne tells us and you will also see in the images I have posted, that her cat Taeko and her family of Magpies have a very friendly relationship and often share afternoon-tea chit-chats! Robbie Anne, I hope I have got the names correct? If not let me know! You may be right about the old Mum Magpie being pecked to death. I have two thoughts on that. 2) My second thought was that a wondering raven or crow my have come across the family and the female Magpie may have died protecting the younger Magpies? In my area these birds are enemies as the Crows/Ravens steal from the nests of all other birds,eggs and new born chicks. Horrible to think but I guess they have to eat! It looks like your Miss Possy should be called Miss Bossy. Our local Magpies are used to being fed by we mere humans and do not swoop on us at all. Yet only a little way away you have to be careful at breeding time. Well Bev thanks again for sharing your story on your Magpie family and we would love to read any updates you would like to share. We have had the same Male Magpie for nearly 25 years. His name is 'Chick-Chick' because he is so big! He is onto his 3rd wife and from my observation, the 3rd wife seems to be his daughter from the last batch. Mum was still around and mysteriously found dead on neighbours lawn, looking very much like it was pecked to death. Is it possible that this was a conspiracy between father and daughter so they could begin a relationship together? We have handfeed him and his wives with mince all this time. Love the carolling. New Miss, named Possy, swoops on the 2 kiddies riding their new bikes on our footpath and it is not any where near breeding season. Do you see any sense in all this please? G'day @ Phillip Tullio thanks for the great story about your family of Magpies :) It's interesting that they enjoy water melon . 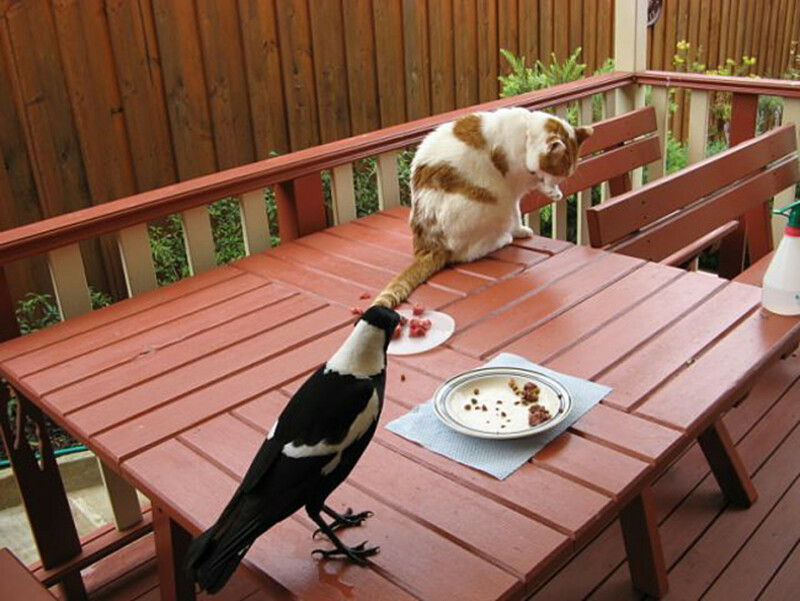 I have never tried feeding our Magpies in that way ! LOL on your 22 Magpies on GF day on 1990. It looks like the Magpies will have to wait another 32 years for another premiership! What do you think ? At least my team the Tigers got the monkey off the shoulder last year ! Our little Toy Poodle 'Oliver' just sits and watches when we feed the Magpies and waits for his share. He does not get any because he is on a special diet and does not eat anything that the Magpies eat. Thanks again for the story and I'm sure the readers would love to catch up with any updates about your Magpies that you my care to share. Hi Dianne and thanks for the great observation and share ! Magpies are very clever birds and will do what they have to do to get their 'Prey' into the correct size. I have seen them break the bread into smaller pieces (btw bread is not good for Magpies) and rub it into the dirt to soften it up for their babies. Magpies will also eat the bread themselves then 'regurgitate' the bread and stuff it down their babies throat. Magpies are a very interesting birds to observe. They have many traits similar to we humans ! Today I saw a magpie put its foot on a piece of bread and break the bread using its beak. It then ate the pieces. Is this normal behaviour for a magpie? 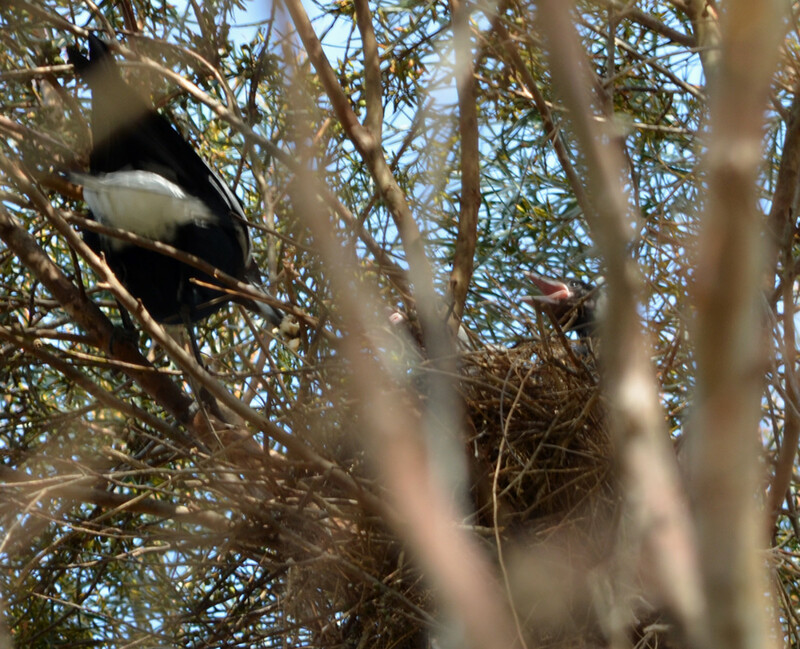 It is very enjoyable to watch Magpies build their nests, hatch their chicks, gather food for the new born. Then watch with great trepidation the antics of the Magpie chicks as they take their first flying lessons ! You have found out by your own experience just how territorial Magpies become ! It amuses me that they only seem to reject other Magpies, I have seem them actually share food we have put out with birds such as Wattle birds and Lorikeets. I wonder if you have put out a bird bath for the Magpies ? @ Teresa, Hi Teresa my sincerest apologies for taking so long to answer your very disturbing post ! It is a shame that so called 'progress' must interfere with our native life ! Unfortunately Magpies are not an endangered species so I believe that the Authorities would more than likely tell you that nothing could be done to protect the birds habitat ? Magpies are renowned for being very territorial and it is my opinion that if the birds were not nesting at the time of the trees being felled they would soon find a new home close to where they were located. I hope that you come back and read my reply and can let us know some good news about your Magpies ? I'm wondering if your situation has changed since you posted ? In my experience I have found that the Male Magpie is the one that is 'banished' from the flock as, very similar to us humans, having two Alpha males in the household is not good for the harmony of the family ! Also the female birds are usually kept around to learn the skills of being a good Mum such as feeding the nieces and nephews as they arrive in later hatching's ! Of course I may not be right lets know what you think of my explanation and how your family is growing ! Hi, I live in West Brunswick Melbourne. We have been feeding a family of Maggies for about a year now. There is a huge gum tree in our neighbors backyard where this family had a nest last season. We watched the mum and dad build the nest and raise 2 babes. Now they come morning and night on to my husbands shed to be fed fresh mince. They sit in the trees calling and I walk outside and whistle and they come down. This morning suddenly there was 5 on the shed. Very quickly my 4 swooped this interloper and moved him on. They then all warbled in unison, obviously making my yard and shed roof as "their" territory. When they had finished eating, the dad came right over to the edge of the shed and "eyeballed" me warbling clearly telling me "don't feed him". It was hilarious. I will be interested to see if he returns. Well I guess Harry can be male or female ? However in my experience the female Magpie is much more 'timid' than the male bird, which makes me think that your Harry is a male Magpie? I'm not sure of the accuracy of this observation in that the Male Magpie has 'pure white' back feathers but the female has a 'scalloped' look on the back ! Check out some of the pics up the top ? Also in my experience the Magpie family (when you get one and I'm sure you will lol) only has one 'alpha' male and more than one female bird ? It never fails to amaze me when reading stories similar to yours just how trusting the Magpies become of we 'humans'! I am sure you agree with me that we do carry a heavy responsibility on our shoulders when we take on the 'task' of feeding our feathered friends. You are indeed lucky to have inherited a family of Magpies and I'm sure that they will give you years of the sort of enjoyment that many people would never experience. Thanks again for sharing with us your Magpie tale. Hi, so glad I found this blog, I have to go to the top and re read it all again. I read what you wrote but didn't read all the comments yet. I have a problem. I too love magpies and have a family living right near me and we have been looking after each other for about ten or so years now. I live on a service road on a main road and there is a strip of grass separating the service and main road. BUT NOW they are going to widen the main road and that is the problem. The strip of grass has ten gum trees which is where the magpies live and they are all going to be cut down for the road extensions. I am very worried what will happen to these birds and I voiced my concerns but only to fall on deaf ears. What will happen to these birds when their home is gone? If the birds relocate, will they come back to see me? Is there anyone I can go to that will help these birds keep their homes? I have a family of 5 Magpies - Grannie, an Alpha Male, a younger male, his Sister and an 18 month old Female who got all of her black adult plumage about 3 months ago. The young female has been missing joining the others for breakfast for the past 3 days and I was wondering if they have forced her to move to another flock as she is now an adult and if she stayed and was to breed it would further weaken the gene pool? For about 3 months a young maggie has been visiting us. Seems to be a loner and other maggies give it a hard time. Not sure if its male or female, but I call it Harry. Only have to call his name and comes running across the yard for his feed. Now hops straight up on to my knee and feeds from my hand. Can stroke his breast and his feet. Next step touch his back but so far not much luck. a real character - will stay with me for some time and then off. Sits on the kitchen window sill for hours and likes us talking to him through the window. great liittle mate. I have a biased affection for our Black and White feathered friends,being a pies supporter. My first meeting with them was 5 years ago when 2 Magpies appeared in my back yard about 1 month before the 2010 grand final. I had a spare meatball that I fed them and the rest was history. Everyday they would return as I ventured my back yard.They would watch from the tall trees in a school behind my house. The female got so used to being fed that oneday it walked into my lounge room to my surprise giving me that stare of "well are you going to feed me?" After a few days of just walking in and trusting me,i was able to feed her straight out of my hand. Meanwhile with all this going on,i thought it was a good omen that Collingwood would get to the finals and grandfinal and win after 20 years. A couple of weeks later a baby magpie appeared with the parents and the cycle continued until a few months later I observed the father pretty much pecking the young one during feeding to move on and get on with your own life. They stayed around for a few months and disappeared and happily returned about 1-2 years later. Last year i moved onto a 3 acre property and was happy to be told by the previous owner that they have 2 regular magpies staying almost 10 years now. Last September /October the parents showed up with 1 newborn,to my surprise a couple days later #2 shows up! Now I have 4 magpies to feed whilst my cat sneaks up to them hoping for an easy feed of them. Luckily the maggies are smart enough to keep a safe distance from puss and I think puss is slooowly getting used to them being there....but he can never be trusted and I have to keep watch. Thank you for this awesome hub, Peter! I love magpies but did not know so many facts about them especially that they mate for life. And sorry about that little one that had fallen from the nest. And a very interesting story at that ! In all my years of experience with Magpies I don't think that I can ever remember two Dad Magpies feeding the baby Maggies? I have seen two female magpies feeding the young but no not two Males! It might (and only guessing here)be that one of the males is an offspring of the ''alpha'' Magpie and has not yet left home! Thanks again for the visit and lets know how your young Magpie is getting on? My Dad feeds magpies with mince in his backyard and has been doing so for over a decade. He has recently observed a baby magpie being fed by 2 dad magpies and one mum magpie is this common? It is a great Magpie time over here in Gippsland as our resident Magpies have just had their babies and they are entertaining us most of the time! Occasionally we do help them out, especially when the ground is dry, as it is a continuous job feeding the chicks but only until they can start foraging for themselves ! As far as where they roost in the wild winds ?, I would say you are correct as I have been told by a number of people that when you are deep in the heart of a large tree it is quite calm, it just 'sways' a lot ! We recently moved to tassie from Perth WA and in both states we have had the pleasure of a family of magpies taking residence in our yard. Our place in tassie covers three acres most of it wrapped around the house and we love watching the fun and games the magpies get up to. Thank you for your web site your comments on their behaviour tallies with what we have observed, with both parents helping the new young once they can land on the ground and the male especially is a fierce prptector of them. We occasionally feed them in winter when the weather is cold and windy and often wonder how they can survive the wet cold nights. Do they roost in specially dense trees on very windy nights? Lisa, you are very welcome and I'm sure others as well as myself enjoy reading about how our beautiful Magpies enhance we humans lives! I'm not sure if birds 'think'/ 'behave' in the same logic patterns as we humans and sometimes we just have to 'go with the flow' and enjoy their company while we can! Recently our other native birds, especially the Wattle Honey Eaters have been building nests and breeding and are behaving very aggresively toward other birds that they normally tolerate! Forcing the other breeds, even the Magpies to seek safer ground. Mum and Dad Magpie could also be sharing nest sitting duties until their eggs have hatched ? Now that Spring has Sprung the nest building around here has really kicked in and I have noticed quite a few on my daily walks. One interesting nest is the Swallows nest made out of all sorts of things held together with what looks like mud ? You may be correct, I never actually considered that. That would definitely explain the reason that the younger of the three magpies seems much more confident than the other two! The only thing that still baffles me is what happened to our original pair? My partner and I were quite sure that we were actually feeding the alpha male and female as they were quite aggressive towards all other birds, including their own baby once they'd had enough of him. The big male stood over everyone for food, even his own partner! And the pair of them attacked every crow, currawong or other magpie that came anywhere near our yard, but now we just don't see them anymore. The male magpie was a great bird... so much personality! I used to love when he would sing his magpie song at my kitchen window while trying to peek through the curtains. He was also quite fun to play with - I would throw food up into the air and he would jump up and catch it. 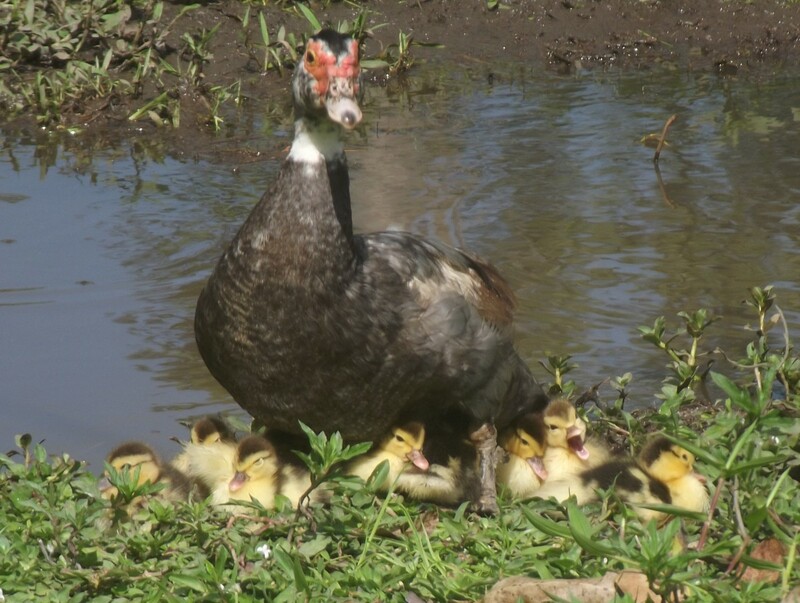 I feel generally speaking that there is usually only one Alpha Male in any family although we have found that females or Aunties as we call them can hang around and help in feeding the mothers younger chicks. That is until the 'Aunty' Magpies decide it is time to start raising their own chicks and then they go searching for a good healthy male who has been 'kicked-out' of their own family, due to the Alpha thing! In answer to your last question! My feeling is that it is more than likely one of the offspring returning with a new family ! Magpies have a good memory for good deeds as well as bad and they may be just 'breaking' you in to their new family who have not got familiar enough for 100% trust! Keep up the good work and I'm sure that before long they will be taking food out of your hand. Hi there! After much searching, this page is exactly what I've been looking for! I too had the pleasure of befriending a magpie couple who have been coming to our house every day for about a year now. We did the exact same thing that you did as far as feeding the birds minced meat and the male even became tame enough to hand feed. Last year they introduced us to their baby and about six months ago they kicked him out of home. Recently the female disappeared and returned about a week later. She would fly down to get her mince, break it up in to tiny little pieces and fly back and forth to a big nearby gum tree (obviously to feed her new chick(s). She did this for about a week, then both the male and the female completely disappeared for about two weeks. Now we have two magpies that visit our backyard, but they don't seem to be the same ones? They seem very scared and unsure, almost like they don't trust us. Occasionally they have a baby with them, but it doesn't seem like a new baby as it doesn't rely on them for food, or make a sound. Do you think that we are feeding the same birds, or do you think this is a different family of magpies? I'm not sure what's going on!? @Nathan you raise a 'great' point and I would like to explain that "the decision to humanely euthanise the baby magpie" was not arrived at quickly! The Vet and I had quite a discussion about the best cause of action and he even called the Wild Life authorities to get their suggestions ! It all happened too long ago for me to remember the exact details but I do still believe that we came to the right conclusion! I am not a Vet myself and hold no Medical degrees so I had to rely on the Vets advise that the young bird had too many injuries to fend for itself. The advise from the 'Professionals' was that the parents would not tend to the young Magpie (survival of the species ) and it would more than likely be ostracised from the family and be left to end it's life in a very unsatisfactory manner. Nathan thanks again for dropping by and raising this 'ethical' question ? G'day there MagpieMatty and a warm welcome to Australia :) I hope you are enjoying yourself up in Brisbane! Sorry I have not replied earlier, however I sure enjoyed reading your Magpie experiences. I am envious of you being able to play the guitar and I'm sure that the Magpies love the sound. I believe that it is wise move to not overfeed as you don't want the Magpie to become reliant on you for their nourishment. It looks like you have really got the 'nack' to being a good 'friend' of our feathered friends and I hope that you keep up the good work! Thanks again for sharing your encounters and please keep us up to date on your newly acquired Magpie family ??? Love the article and so glad to read about your experiences with these creatures. I am saddened to read that "the decision was made to humanely euthanise the baby magpie" as I feel this was not yours of the vets to make. It should have been taken back to its parents to do what magpie parents do in these cases. What was the reason the vet and you decided that what you thought/wanted to do was more important that what its parents wanted to do? Hi there agvulpes! I'm new to Australia from New Zealand, currently living in Brisbane. I had my first encounter with a family of friendly magpies less than a month ago. The dad would quite frequently wonder around the lawn, waiting for me to stir up bugs in the garden. After a couple of days, the mother would join and they would gladly take food from me, even recognizing when I would come outside. This morning as I walked outside, I heard a loud carol and felt mum magpie flutter past me, feeling the breeze from her wings. That's when I noticed dad magpie was hovering on my right side, briefly landed on my shoulder then touched down to the ground. I've had frequent dealings with this family. They have a young one that joins them on my lawn. They greet me and thank me for food every time they see me, even responding to my poor whistling attempt. They've become quite accustomed to me playing guitar outside and will often try to out sing me any chance they get. Being cautious not to overfeed, I've become rather attached to these birds and have fallen in love with another nearby magpie family that share my lawn with the original 3. Reading your blog was incredible, and I'm so very sorry to hear of the loss of the youngling. G'day Belcaesar and nice to read your great story! The Sun Conures are sure a beautiful bird. I'm not familiar with them , they look like they might be 'talkers' ? Greg and yourself seem to have found the ideal careers and I sure do wish you well in the Aquarium ! Are you anywhere near SeaWorld by any chance? 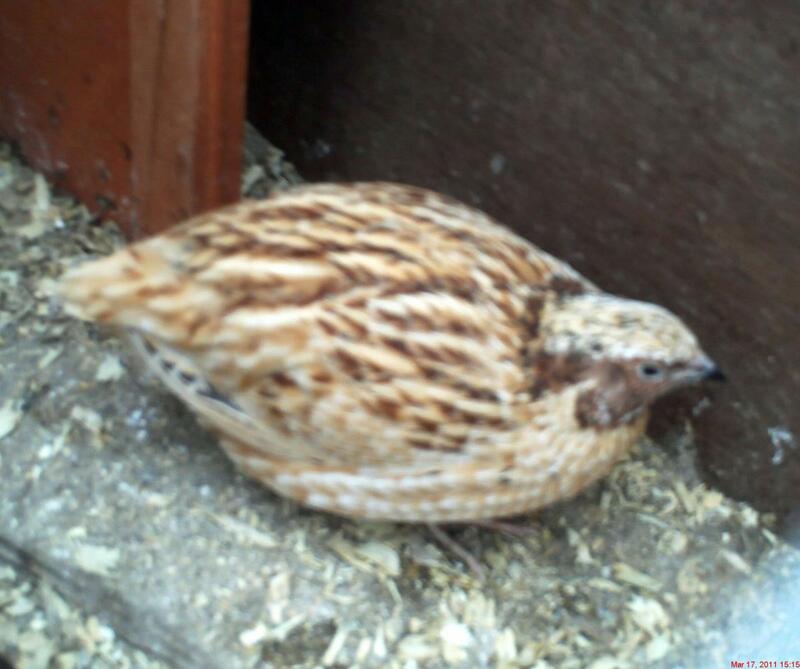 I'm sure that you will make a great foster Mum to your chicks and I suppose by now the feathers are well on the way? I have noticed our Magpies have started the nest building process so I guess that must sense that winter is drawing to a close and Spring is just around the corner! They are gorgeous, I do love my birds but I so wish we had the Maggie for support. Things have changed a lot. Greg and I are both now working at the same place at a huge major produce store near us. Hence the Conure Chicks. I am the Manager of the aquarium section. I am now breeding fish for the store as well..... So I have an awesome job now as well as mum to some very vulnerable chicks. @missmypinetree nice to read your update! Good to hear that old bumpy leg and family have 'resettled' now that next doors cat is gone! We also see the Magpies gathering sticks and stuff for their nests might be an early spring this year? @missmypinetree I'm glad that you still have your family of four Magpies! As far as when does the baby stop crying? That good old Bumpy Leg is doing really well and seems to be quite the Matriarch. She has a real dynasty going there doesn't she ? There will always be an Alpha Magpie it is the only way to ensure the survival of the Species! I hope you enjoyed the game the other night? I sure did on the TV! I have yet to see a Magpie lose a fight with another bird , they even chase the much bigger Eagles and Pelicans away from their territory ! Um Agvulpes ? when do the baby cries stop ? lol .. that baby bird has me well trained lol.. It's great to hear that you are only giving them snacks as we do try to talk people out of the idea of feeding the Magpie too much! They become reliant on getting the feed and loose the 'knowledge' to forage for their own tucker. Plus we may not be giving them the correct nurishment that they need ? If you want to send me some images to share I can always post them onto this article? we have a lovely family of magpies who visit everyday. One cheeky young fella will even 'knock' on the front door with his beak. We do not feed them everyday as there are a lot of young and do not want them the rely on the daily feedings, however my partner does 'talk' to them everyday. I have photos of him sitting on the driveway surrounded by up to 15 maggies. When he feeds them, they perch on the toe of his work boots and even sit on his knees and take there food! Look forward to hearing the cheeky young one everyday knock on the door and have a crunch at any cat biscuits that may be left over! @belcaesar wow you do have quite collection of 'animals' on your property ! The tiny birds may be finches ! If you are lucky they may also be Fairy Wrens and if you are very lucky you may get some Superb Fairy Wrens ! Do they fan out their tails? Speaking for myself and I'm sure our other Magpie Nutters would love to read your children's books about Magpies so let's know how it is progressing? 2) They may well be busy building a nest ? Who knows you may have a new member of your family before long? Aaaand never mind, they actually showed up tonight! Perhaps they were just being fickle, although I don't know why they'd skip a treat that is basically guaranteed! I've been feeding my local pair of magpies for just over a month. Mr Magpie quickly learned to recognise me and the little plastic ziplock bag that his treats (a couple of small chunks of lean mince, once a day) came from and soon became confident enough to take food out of my hand. The Missus was a lot more wary and always stayed about 2-3 metres away. I also enjoyed seeing Mr Magpie teaching the how to find food late last year! I'm getting a little worried as I haven't seen them in about 4 days. This doesn't sound like much but you could set your watch by them, landing in the backyard and carolling for treats at around 8am and/or 6pm. I still hear magpies carolling in the morning and sporadically throughout the day. Occasionally seen a lone female swoop straight through the backyard; if it's Mrs Magpie that seems a little unusual as she and hubby usually hang out together. I've tried putting out little morsels of meat on a white tile in the backyard and the food always disappears after a few hours but I've no idea if it's my magpies or something more sinister, like some unwelcome pigeons! Any thoughts/ideas on why they might suddenly stop visiting after being offered delicious little meaty morsels every day? I have seen Magpies do exactly what you describe but only when it is extremely hot ! Have you seen how a dog will dig and roll around in the dirt to find some cool spot, I think the Magpies do it for the same reason ! They also seem to 'pant' similar to a dog! I have also heard about the 'ants nest' theory but to be honest I don't put much credence in the story. @Claire yes the magpies have a way of 'selecting' a family don't they ? I reckon that it may be ESP or something like that ? Ah Montgomery what a great name for a Magpie, very General like the way they march around ! Oh yep the Magpie are very protective of their young as I have found out many times and they hate the Currawongs! I believe it is because the Currawongs will steal the eggs of the other birds and given half the chance will even eat the babies ? We are Magpie nutters as well and sit on our deck watching them fossicking away all day for food and teaching their young to do the same! Claire thanks so much for sharing your story. I'm sure all of the other Magpie Nutters would love to keep hearing updates ? Can you tell me why Magpies lay flat out in the garden, "playing dead"? I have read conflicting reasons - laying on an ant's nest, so the ants can clean the feathers of lice and mites - and because it's a way of relaxing into a "trance-like" state. I'd be interested to hear some facts. Thanks. I've loved reading ur story. We seem to have a family of magpies to feed wherever we are. We have also noticed a pied currawong flying around but Montgomery won't let him down for a feed... Which I'm happy about. It appears that I might be birdist?? I do remember a time while living at home with mum and dad that one of baby magpies got hit by a car and dad tried to see if it was ok but the dad magpie kept swooping him and wouldn't leave the baby alone. It was like he was in mourning. Years and years would would have the same magpies have new baby's and there was usually only 1 surviving baby... I think once there were 2 babies.... They are beautiful creatures if u give them the time. I'm absolutly a magpie nut - but I barrak for the dees! @Mel g'day to you and welcome to the Magpie Lovers Club ! I commend you for looking after our feathered friends and these birds are very adaptable and seem to be able to cope with any 'handicap' thrown at them. 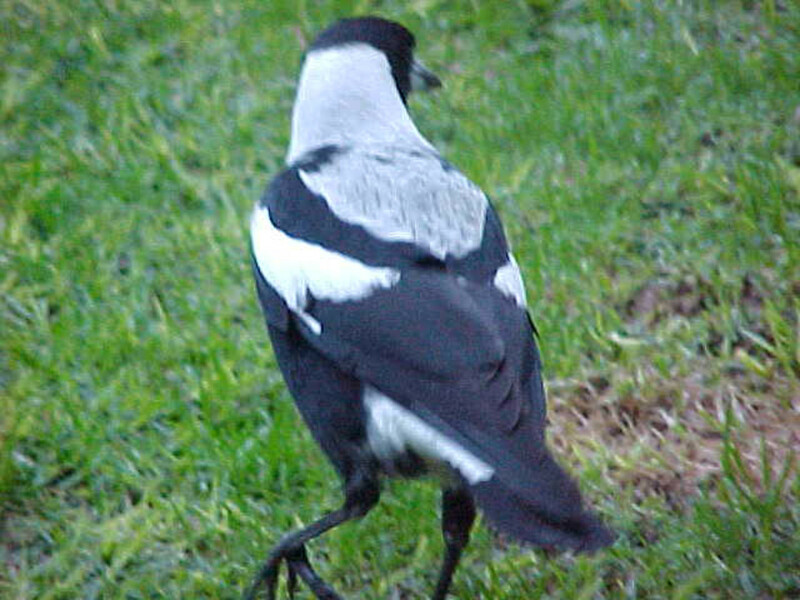 I have seen a few Magpies with damaged feet handling things ok but I have never seen one with only one leg! My concern is that Magpies actually 'walk' like humans (one foot after the other) and do not hop! and may not manage on one foot making him easy prey for predators ! Is the young Magpie showing any sign of distress like picking at his feet etc. ? Maybe you can entice it into a 'friendly' trap to cut off the bonding material? I have been feeding a family of magpies for over 12 years with the mail being able to hand feed. He has a broken beak with the top half missing, but amazingly does quite well. I have a question regarding one of their babies who has been coming down for around 4 months. I have discovered he has twining or cotton wrapped around one of his feet and and would like to know would he survive on one leg if i cant catch him to remove it. It looks like you have indeed 'acquired' a new family of Magpies ? It may take a while (maybe never) but if you keep persisting by putting out the 'traditional' Magpie treats you just may attract the new Magpie family down to your Garden! Hello again, well I thought I had some good news for you. I arrived home yesterday afternoon and saw a male maggie sitting on one of the fence posts down the end of the paddock. I raced inside so excited and onto my front deck and I called him and called him, but alas he never came to me. I went back inside and picked up my binoculars and saw him fly away. I followed him with the binoculars and saw him land in a tree, then 3 others arrived. I thought yes, it is my maggie family, plus a new baby. I called them for about 5 minutes, but they still did not come to me and eventually they flew away. I do recall a few months ago now that my 3 maggies were defending their territory against 4 other maggies, by chasing them away. Now I think about it, and have seen these 4 maggies not 3, do you think it is possible that these 4 maggies were successful in taking over the territory of my maggie family, and pushing my family out. Maybe if this is the case then my family might come back and regain their territory. Every morning and afternoon when I arrive home I put out their favourite food, mince meat, plus bread and wild birdseed mix. My butcher birds, miner birds and rosellas still come for the food every day, but I really wish my maggie family would return home to me. I will continue to call them and hope that one day soon they will hear my call and come back home. @Tassie Girl it is reassuring to know that your neighbors are not the kind of people to stop Magpies from coming around. The other possibility is that, and I really hate saying this, they have found another place that they prefer? I have seen Magpie families here that alternate between different houses until they find a 'preferred' place and will stay at that place until they are 'enticed' somewhere else? Try putting out special treats like 'mince meat' (just little bits) and any other treats that you can remember the Magpies enjoying. You could try mixing up the recipe mentioned above, Magpies really love it? I sure hope that your adopted Magpie family return to you soon ! Unfortunately for us up here in the sticks we don't have many choices and they are the best of a not so good bunch ? I'm surprised that you have not been able to attract any Magpies, just a thought have you tried putting out some raw mince beef to lure them over :) Don't want to drag in the vermin though! Your Pepa and Odie sure sound like great characters and very friendly, except to the Mynas of course lol It could be the Mynas have taken 'possession' of your property but I would have thought that at worst they would co-exist or the Magpies would be a more powerful breed to drive out the Mynas ? We are fortunate down here as we don't have the Tick problem however we went for a drive today to visit Lake Tyers were there are Ticks and had to check Oliver thoroughly when we got home! I sure hope you are adopted by a 'young' Magpie family in the very near future! Thank you Agvulpes so much for your reply. I have had the same neighbours all the time I have been living at my home. I believe most of the people who live nearby know that these are my maggies as I am sure they hear me calling them each morning and if they looked closely they would see them fly down to me. I have been of the same opinion as you that if my maggies had more babies, they would indeed be visiting more often for more food. My heart sinks every morning and night when I call them and they don't come down, and to think that they may infact be hurt somewhere and I can't help them. I miss them terribly. Hopefully you find out something in your research or maybe one of the other magpie lovers can help. I will let you know the minute they return to me. It will be a glorious day when they do come back to me. GOTTA love Telstra. I think I could rely on a crow to steal food more than I could rely on Telstra to get communication right. I believe that Magpies do have a way of understanding / communicating with we humans, if we take the time to listen and observe their behavour ! Hmm... ok lets get down to the serious matter of 'where have my Magpies gone' ? It seems to me that you have done everything right and on the surface it surprises me that the 'whole family' just up and disappears at the same time. Just putting out some observations here: If they have had babies it is my experience that they would be around all the more looking for food for the baby Magpies? It's almost 'unthinkable' but do you have neighbors that may not like Magpies and do something to facilitate their removal ? I can't think of much else that would cause them to up and leave so I will leave it open to our other readers. Maybe someone else has had similar experiences and will fill us all in on the outcome? In the meantime I will do some research of my own and see what I can find out! Hi, I have just discovered your wonderful site and find it comforting to learn that I am not the only obsessed magpie lover around. I have been feeding my mum and dad maggie now for 7 years and they have become very tame with daddy maggie eating out of my hand. In the mornings I go out and call them and they both fly down for their food. They even wait for my car of an afternoon and guaranteed, by the time I am inside, they are waiting for their food. If I am late rising out of bed on the weekend, they come and sit outside my window and call me until I go outside, have a chat with them and feed them. Each year they have had babies and brought them down to meet me, I feel very special that they trust me enough to do this. I have not seen my maggie family now for 4 weeks and I am getting quite worried about them. They have just disappeared, I call them but they don't come to me, and I can't even hear their beautiful call. I know it is breading season, could their absence be because they are looking after their new babies? I can't recall them ever staying away like this over the last 7 years. I live on a property and there are no busy roads around my property, so it is very unlikely that they have been hit by a car. I hold out hope that they will surprise me one morning (hopefully soon) with their new little babies and all will go back to normal. I miss them so much, they brighten my day. Daddy maggie and I have built up a special bond and I am sure that when we are talking he understands what I am saying to him. I always thought that once magpies have found a home, they don't leave? It is so hard with Magpies, just when you think they are the smartest they up and do things that are 'instinctive' and put themselves in harms way. btw on the bright side I witnessed another 'dog fight' today between an Eagle and a Magpie and would you believe a Plover ! @Oldbeakie thanks for dropping by do you have any updates on your Magpie family ? i wanted to take it to the emergency centre .. i had phoned them .. if it was going to be okay a carer would have apparently taken it til it was better and if it wasn't going to be okay.. well .. you know the rest..i just felt sick .. i had all 3 adults watching me while i cradled it lol.. and as for the seagulls ?? im near the beach .. if they want to outnumber the maggies they will.. they took last years babies from a smaller tree. I sure hope that the baby survives? Some times putting them to 'sleep' turns out to be the kindest way to treat them. We have to consider "are we saving them for their benefit or for our own enjoyment" ? Your last comment is heartening, you may still have a Magpie family. Lets hope !!! no need to apologise i myself didn't log back in here til Monday just gone. I managed to get a picture of one of the babies on Monday and i logged in here to try and post it .. but Monday night one of the babies was hit by a car (i heard the commotion) .. i picked it up off the road and it 'came to' .. parents were swooping me and i was in many minds about what to do .. in hindsight i should've taken it to the AEC..i was very distressed and thinking it would be euthanased ..it was managing to hop up the tree to as high as the fenceline .. but in tending to that baby i think the seagulls got their other baby and after speaking to a neighbour there were apparently three babies but she thinks dogs may have got the 3rd one a few weeks back. Hi there @missmypinetree and sorry for being tardy with my reply. Oliversmum and myself have been up in Merimbula doing some Whale watching and what an experience that is !!! Great to hear the news about old Bumpy Leg you are sure collecting a lovely family of Magpies. On the bright side though, I witnessed a 'dog fight' between a Magpie and a very large hawk (Whistling Kite) and the magpie drove the Hawk away, not once but three times!!! and @ agvulpes ..photos soon ! i get my new phone delivered tuesday ! anyway enjoy your magpie families .. i will keep you posted ! What you have described sounds pretty much what I have experienced myself. Yes the Chicks hobble around on the ground as their 'fledgling' feathers have not grown sufficiently enough for them to be confident to fly. It's a bit like a baby learning to walk. We know they can but they have to 'feel' that they can themselves? However the Magpie chicks are quick learners and it should only be a couple of days before they are taking short flights ! Hi we have had a pair of magpies nesting in our front yard. Over the weekend they left the nest and have managed to stay alive 3-4days so far. I understand they are ground dwellers until their tail feathers grow enough to be able to fly. One baby is very strong and perched on a twig. Granted I haven't seen it leave it's perch yet! The other two hobble around and been huddling in garden beds. My question is are they supposed to be able to walk yet? They hoble around and use their wings to hop along the ground. @Oldbeakie I agree that missmypinetree must be having a lovely time with her family of Magpies. It's great to hear that you have your 'Special Time' with your feathered friends and I'm sure that they also regard it as special? So until next time, have some great fun time with your Magpies. @missmypinetree it is great to read about your menagerie of the various 'animals' and isn't it great to see how the different species, if treated right, can get on together so well! btw: If you have have any pictures relating to your Magpies and would like them included in the article for people to see by all means submit them to me via email attachments. images4agvulpes@gmail.com with some explanationory text to go with the images! Oh you are so lucky having a Ring Tail Possum and baby in residence, lets hope that they become part of you family ! Well we can't wait to hear what your Magpie friends have got up to and would love to see the images ? That's beautiful missmvpinetree. Thank you for sharing. I would love to put photos of my magpies on the site, but I don't know how to add a photo. Could anyone help me with that. I'm sitting out the front feeding all my beautiful feathery friends and loving it, this is my special time and I am so grateful for their presence. Enjoy your long weekend (labour day Monday). well i saw one baby yesterday ! maybe there's only one ? it's quite big ! it was sitting in a gum tree lol ..they were also being protective of it and feeding it etc.. when i got home from work it was still sitting in the same spot but today its moved back into the elm (well i think it's some kind of elm) so bumpy leg is finally a Mum again !! hooray ! after two years of no babies..hopefully they are now a family of 4 or 5 . @missmypinetree... wow that wind sure was something wasn't it ? We copped a bit up here but my son said it was very very bad in Melbourne. I hope that not too much damage was done to your property and Magpie family ? Our little guys, we have noted 4 so far, are progressing along nicely and Mum and Dad Magpies are naturally being very protective of them ! ooh grated cheese ..that's a bit cheaper than mince ! Hello Agvulpes ..how are my (i call them mine too haha) fledglings supposed to survive this Melbourne mini storm ?! :( ..
i only pray i can hear their beautiful 'mag mag mag' cries in the morning..or when this horrible wind settles. From what I have read the problem with 'mince meat' is the preservatives that are added , not good for the birds apparently! Grated cheese seems to be OK in moderation however most 'experts' try to educate us to only give our Magpie Family only treats and not let them become reliant on us for food. Hi there. I am in Camberwell in Melbourne. I have my own family of maggies (well I call them mine). They are up to their 4th generation. I feed them mince meat & other bits & pieces but their favourite is grated cheese. I hope I am doing the right thing when I give them the cheese. Even the Wattle birds like this particular delicacy. I love seeing the magpies wipe the grated cheese on the ground as if it were a worm or similar. @William I must preface my comment by stating once again that "I am not an expert" ! 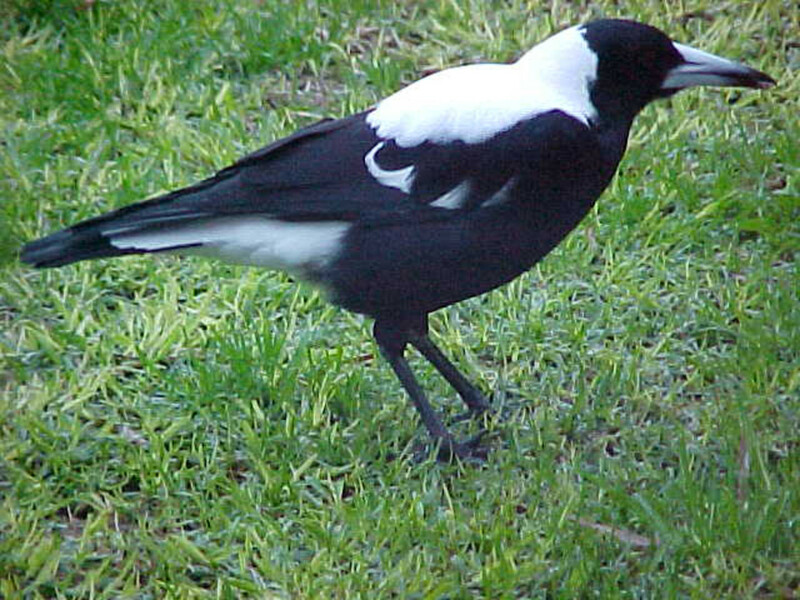 By my observations I see the same thing as you with the Magpie cocking its head to one side then dig its beak into the ground and pulling out a worm. As far as I can ascertain Magpies have the senses of Sight, Hearing and Feel. My guess is that their senses are more 'heightened' than those of we humans? So with a combination of these senses the magpie can feel the Worm moving through the ground with it's feet and by focusing its hearing can pinpoint the hole where the Worm is going to emerge from and with it's head cocked to one side can focus its 'eye' (like we do when aiming a camera )on the hole for it to plunge it's beak into the ground to grab the unsuspecting worm. William thanks for the great question and I hope this gives you some sort of explanation? @Oldbeakie I could not agree with you more there is nothing we can gain by dwelling in the past, learn the lesson and move on ! Looking forward to hearing about your 'babies'. It seems early but we have spotted a couple of Magpie babies around here already ! 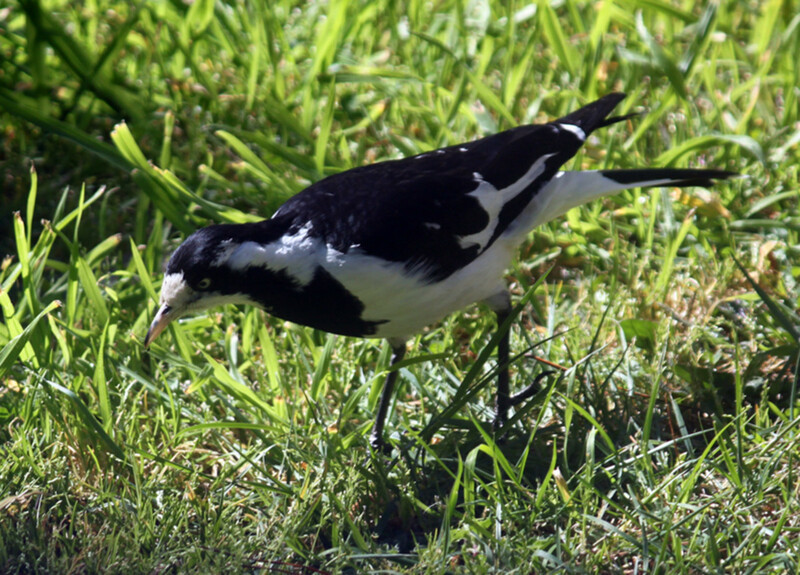 Hi, Could you tell me if Magpies can hear worms in the ground as they appear to listen to the ground with the head on the side and then dig and often pull a worm out. If they can hear worms what do they hear ? Could you please email me your reply. My email address is willnakken@hotmail.com Thankyou. Thank you Peter, you are right, magpies are so resilient. I think us humans need to learn a little from our wild life species, thus being the ability to let go of hardships and move on without guilt or blame, there's a lesson to learn in that. PS looking forward to the babies!! The survival of the species is a huge 'urge' in every animal and I'm sure Dad magpie is only doing his 'bit' to keep the Magpie breed going strong! G'day David and thanks for dropping by :) I will have a look at your Blog and see how your Magpies are going ! @missmypinetree thanks for that information :) I would love to share some magpie photos with our readers ! 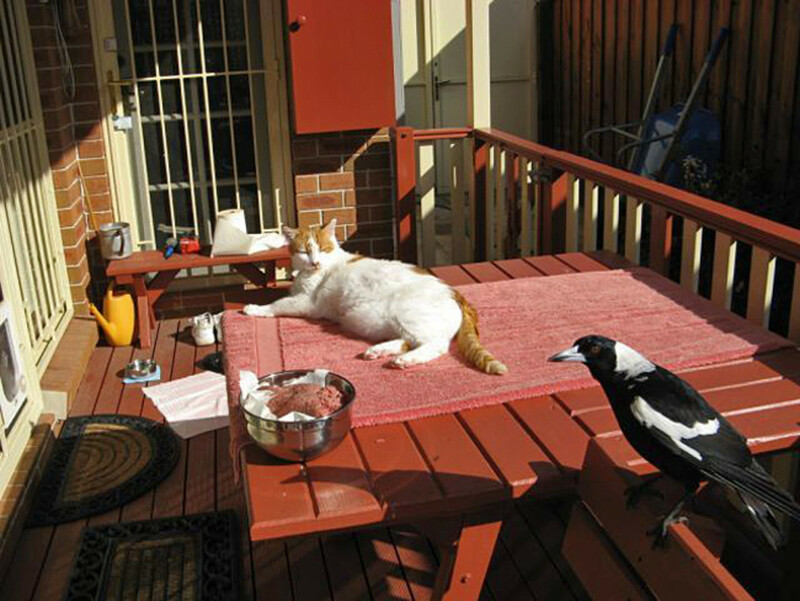 Robbie Anne has sent in some of her photos with her cat Taeko and the Magpies see above in the main body. I am very grateful for your responses and caring nature. I will wait for him to come back, in the meantime I will care for my two feathery companions, and the rest of my bird family. I will keep you up to date too. @ old beakie that is sad.. i live on a fairly busy road that even has a bus route i'm surprised that one of mine hasn't been hit *touch wood* .. and a couple of years ago i had four magpies that has since become three .. but i see quite a few magpie families around here so it's possible that the males do take off to start new families ? @ Agvulpes .. the possum is a little brushy i have a photo of him/her i will try to upload it soon .. i will also try to get a pic of my magpie family ..they've been quite demanding lately lol it MUST be nesting time ! .. And i do hope the Tigers win tonight .. but who knows they're unpredictable ! .. it's not a game i'd like to be at lol it will be feral ! You are most fortunate to have had such wonderful experiences with your extended family of Magpies but sadly like most families, animal and human, it is only 'good luck' if we do not have some 'misfortunes'. I don't think that I have ever seen a Magpie as old looking as your 'Beakie' he does seem to be a grand old man of the Magpie family ? I'm also surprised that the Magpies 'tolerate' the Butcher Birds, who have a tendency to steal the unhatched eggs for their meals ! Sad, I know, but we must all eat to survive, Right? Very saddened to hear of any bird being 'killed', especially losing the Matriarch of the family and I understand just how traumatic this must have been for you and your family. Unfortunately I can't give you a definite answer on whether dad Magpie will return but I could offer a guess ? 1) He to may have been hit be the same car, Magpies do fly close together and he may have been able to fly away and is laid up injured somewhere? 2) He may have realised that his female companion Magpie is no longer 'around' and is off looking for another 'mate'! I hope that the second is the case if so he may just turn up one day with a new female Magpie by his side ! I'm new to hub pages, I really loved your magpie article and I was wondering if you could help me. I am another magpie (all animal) lover and we moved into a house where the previous owners had been feeding magpies for many years prior. We continued this ritual and would feed them once a day with raw mince and have been doing this for approx. 3 years. We've seen babies come and go, but unfortunately there is a road between the two properties that their territorial boundary is, and some babies have been hit by cars. It's terrible and effects me greatly. However the 3 main adult magpies have always missed the cars, we call them mum, dad and beakie ( beakie is the granddad, he has grey feathers around the tops of his legs and has a limp when walking and has a cracked beak. 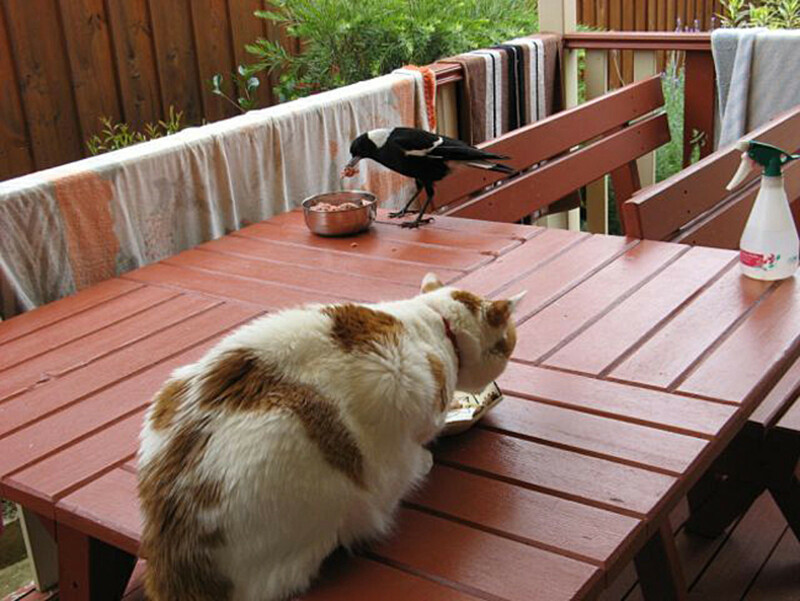 He still fights off other birds like the kookaburras, but it's funny the magpies allow the black and white butcher birds to eat with them. My question is, just over a week ago, mum (magpie) was hit by a car and killed. Our whole family has been devastated by the accident, but dad (magpie) has not returned. I think of him everyday. We have laid mum magpie to rest in a special part of the garden where they would always play and eat. I believe mum magpie had a baby girl, beakie and baby girl have been visiting every day for their meal. Will dad magpie come back? I'm sure glad to hear that the little Magpie with the bad leg has come good ! Just gotta love those cute Possums, BTW is it a Ring or Bushy tail ? I don't like the way the guys are having the little bouts of 'brain fades' looks like a lack of discipline. Just as an add on to your comment, on Sunday I was lucky enough to see a Magpie drive away an Eagle! He was protecting his Territory and some juvenile Magpies that were in the trees. @Colleen not from what i've seen .. my magpies have done everything they can to save their babies ..it's just they're not finding the right tree :( .. i looked out my kitchen window last year and saw so many seagulls circling that i knew the magpie babies had no chance :( .. words can't describe how i felt ..
Hello Agvulpes .. well the Magpies just won (and i'm a Tigers supporter remember haha) .. the commentator said 'never underestimate a wounded Magpie' .. ain't that the truth ! .. I still have my 3 magpies lol even little miss with her bumpy leg that healed just nicely ..i still recognise her though because of the slight bump .. sadly they've not added to their nest since my pine tree was cut down but they're hanging in there !! I'm sorry i've not posted sooner but i now have a little possum that comes just before dusk every night lol he/she is blind in one eye :( ..not quite an adult yet ..loving our Aussie babies lol ..oh and by the way I managed to make it to the G last nite to see a game ..go Tiges ! @Colleen Logie first of all thanks for dropping by and letting us know about your Magpie experiences. They sure are great birds aren't they ? From my experience with Magpies I would suggest that they are very similar to Human families in that 'generally' there is only one 'alpha' male ! Survival of the species means that the other males leave home (or are pushed out) , find a non-related female and start their own family. The female Magpies on the other hand do seem to stick around their own parents ,waiting for a searching male Magpie to come and whisk them off to start the above mentioned family. As a lover of Magpies we have to learn to let go :) and nurture the family that is left behind. Hi, I'm wondering if you can enlighten me? I've been feeding a family of magpies for over a year, when the babies were little things being fed by their mother and whinging constantly. I guess they have now reached puberty, and have done so coming in and out of the house if the door was left open. One even sat on the couch with me! the father bird has been progressively violent with pushing one of them away when he came to my door to be fed. (I called him Bashful, cause he was very shy after having a fishing line wrapped around his leg, which I eventually removed) He would still sneak over when he thought nobody was looking, but I haven't seen him for a week. Now his sibling has disappeared as well. Do the parent birds kick the kids out of the territory when it is time for a new batch? I'm confused and missing my babies, and fairly sure they haven't been killed on the road. The Tawny Frogmouth certainly is an interesting bird and I'm sure that when you start putting out the food to attract some Magpies they will appear very quickly! From what I have read I might ask the question if you have a dam close by? If you do , come spring you may start seeing some Herons and Ibis ! If the Magpie did not enjoy the interaction it would just fly away. Right ? To enable more people to see your video (if it is OK with you) I will embed it into the body of the Hub rather than have it buried in the comments ? I agree with you that Magpies are beautiful and friendly birds ! I would also add that they are intelligent and misunderstood.